If you’ve spent much time in deep woods or around wetlands, you will know that it’s common to hear many more birds than you can see. And sometimes, when those hidden birds finally do come into the open, it’s only for a brief glimpse before they drop back down into cover. At times like these, the birdwatcher’s best strategy is to rely less on visual cues and concentrate on the sounds made by the birds. Just like their plumage is unique to each species, so are the songs they sing. Being able to identify a bird by their song allows you to identify the species you can hear but cannot see. The ability to identify birds by their song alone is a very rewarding skill but one that is not easy to master. Learning to bird by ear requires a different set of skills than those used to identify birds by sight. Bird songs can be fast, fleeting and somewhat confusing, even without considering that many species exhibit considerable variation in their songs. Listening to audio tapes, CD’s or MP3’s of bird songs is a great way to begin learning the songs of different birds. And when you are out in the field, putting a visual identification to a specific song will help further ingrain that song into your memory. 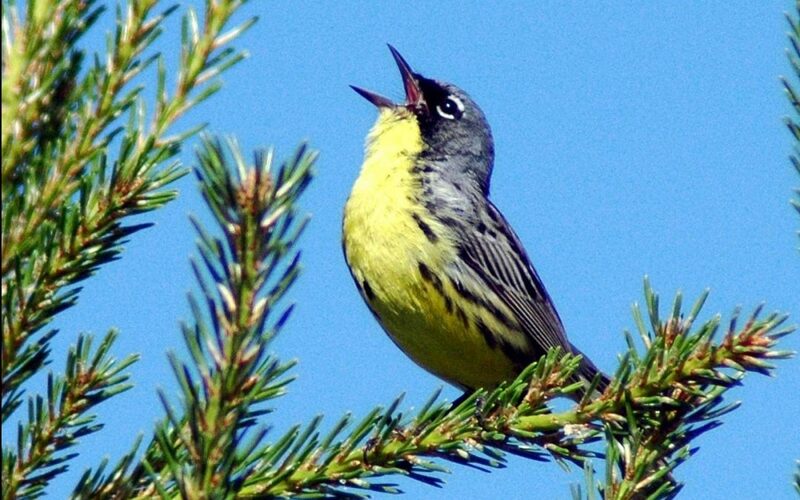 If you are like most birders, you will need to hear the songs many, many times. As useful as bird song recordings may be, you should be aware that variations in song types for one species can be as great as are the variations in their plumage. This is especially true for sparrows, whose plumage and song type can be strikingly different when individuals at one end of their range are compared to individuals at the other end. One trick many birders use to recall a song for a particular species is to use mnemonics; assigning short phrases of words to a song. These short phrases will fit with the music of the bird song and serve as a mental signpost so that when you hear the song, the phrase will pop up into your memory, in the same way that some commercial jingles on TV remind you of a certain kind of breakfast cereal. An example of a common mnemonic is used for the stereotypical Hollywood owl found in so many movies: Hoo hoo hooooo. More specific mnemonics can be applied to every songbird species. A few of the more commonly used mnemonics are listed below. Indigo Bunting – Fire, fire! Where,where? Here, here! Put-it-out, put-it-out! Song Sparrow — Hip, hip,hip hurrah boys, spring ishere!